LONG BEACH, CALIFORNIA – FEBRUARY 8: Pepper performs on stage during day one of the 2019 One Love Cali Reggae Fest at the Queen Mary Events Park in Long Beach, California. LONG BEACH, CALIFORNIA – FEBRUARY 9: Fortunate Youth performs on stage during day two of the 2019 One Love Cali Reggae Fest at the Queen Mary Events Park in Long Beach, California. LONG BEACH, CALIFORNIA – FEBRUARY 9: Matisyahu performs on stage during day two of the 2019 One Love Cali Reggae Fest at the Queen Mary Events Park in Long Beach, California. LONG BEACH, CALIFORNIA – FEBRUARY 9: Dirty Heads perform on stage during day two of the 2019 One Love Cali Reggae Fest at the Queen Mary Events Park in Long Beach, California. LONG BEACH, CALIFORNIA – FEBRUARY 10: Nattali Rize performs on stage during day three of the 2019 One Love Cali Reggae Fest at the Queen Mary Events Park in Long Beach, California. LONG BEACH, CALIFORNIA – FEBRUARY 10: A shot of the crowd during day three of the 2019 One Love Cali Reggae Fest at the Queen Mary Events Park in Long Beach, California. From Feb. 8-10, Goldenvoice’s One Love Cali Reggae Fest returned for its fourth installment, ushering in what’s now become a mid-winter tradition for music lovers in Southern California. After its expansion over the years, the 2019 event had evolved into a three-day concert, which was once again held at the Queen Mary Events Park in Long Beach, California. The sold-out show saw thousands of fans who weathered a literal storm to catch their favorite artists perform. Tarps strewn on the ground made navigating the outdoor venue a bit easier, while stretches of sunshine helped keep the crowd warm and smiling. Between two stages, three days, and a lineup so good that even the rain couldn’t keep people away, there were countless standout moments. 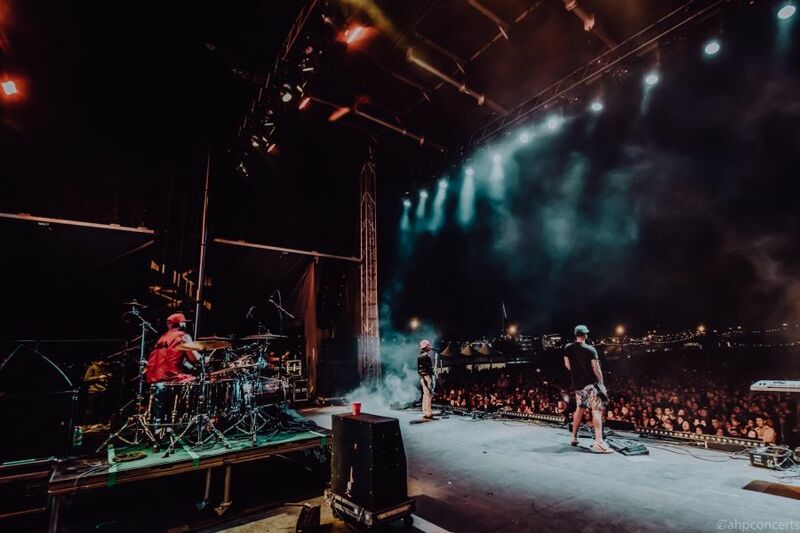 Here are 5 highlights from the 2019 One Love Cali Reggae Fest. One of the best things about One Love Cali Reggae Fest is always the surprise onstage collaborations. The bill is packed with popular artists (most of whom have played this festival on multiple occasions) so one band, welcoming another musician/friend to join them for a song, isn’t too hard to imagine. Friday night, Pepper kicked things off when they invited KBong from Stick Figure to the stage. The trend continued into Saturday when we saw Don Carlos join Slightly Stoopid during their set. You never know who might pop up during any given performance which is a unique attribute that makes this festival stand out among the rest. One Love Cali Reggae Fest has seen a transformation over the years, as it has grown into the quintessential festival experience. Part of that experience has to do with the food. Two designated dining areas are spread out over the grounds, making sure fans are covered at both stages. Upon entering, a row of options is set up for you to choose from. Once you near the other stage, there’s an entirely different section of cuisine to get lost in. In between, if you’d rather not go far, you’re still likely to run right into a Pink Taco truck. The great part is that it’s not only about the diverse selection of food, but, because of the placement, no line is ever too long – even in a crowd of thousands of people. This year saw three days-worth of talent that spanned two stages. Both the KOI Stage and the SMKFLWR. Stage were packed with acts that no one wanted to miss. While each area had an exciting lineup, fans had the opportunity to schedule their stops accordingly, thanks to set times being convenient enough that you didn’t have to skip any one performance entirely. The vibe also changed from stage to stage, which was nice. The KOI Stage had concertgoers packed into the mix of the crowd, while the SMKFLWR. Stage gave people a chance to kick back and spread out a bit more. It made jumping in between both places a pleasant experience and a welcomed change in atmosphere. You can always count on One Love Cali Reggae Fest to spotlight an eclectic lineup and this year was no different. While past shows might have seen more variety in genres, the 2019 experience stood out by highlighting acts that bridged different eras. You had artists such as Yellowman, Fishbone, and Pato Banton representing the ‘70s, ‘80s, and ‘90s. Acts like Mad Caddies and Matisyahu, who first rose to fame in the ‘90s and early 2000s. Dirty Heads and Fortunate Youth (who both played on Saturday) came onto the scene roughly a decade ago. While artists such as Nattali Rize and Analea Brown, are just at the beginning of their flourishing careers. Each musician may have come up at a different time, but they all represent the best aspects of reggae music. Appreciation for the music is what unites people, and this festival is about keeping true to that vibe. Throughout three days, fans endured the rain, they had to work out transportation in a situation that isn’t the easiest to orchestrate, and deal with cold weather – yes, even Southern California sees its share of chilly winter days. At the end of it all, everyone was still smiling. People couldn’t have been happier to be there, getting to see so many of their favorite artists all in the same place. If there’s any big takeaway, it’s that there is power in music. It's about the love. That is precisely what One Love Cali Reggae Fest embodies. After all, the message is in the name.